9/24/07 My first blog. Ever! I've just created a "myartspace" site, which will take me awhile to get just right. This past summer I created a set of images that I'm making into Winter Solstice cards. It started with wanting to make a poster for the Winter Solstice Event that the band MUNDI puts on every winter here in Austin. It grew into a whole summer project with several images of Celtic musicians playing traditional instruments. I was in heaven all summer long! Once I get the site completed I'll post it here for everyone to see. 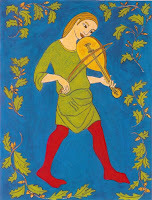 I'll even try to play MUNDI's music in my Celtic Musician Gallery. I've also started attending an artist marketing group this past week. With mixed feelings at first. The question was put forth: "Marketing; is it about $ or connecting?" Once I got it into my psyche that it is about connecting, as well as possibly selling, my qualms were put at ease. I'm now inspired to be more involved with my own work (as I was this summer), even though I'm back to teaching. I am still using these cards for my special friends!